In October 2018, I wrote a piece claiming that the ZANU PF government will collapse within six months if the controversial President ED Mnangagwa is not going to form an inclusive government with Nelson Chamisa's team. I informed you that that Mthuli Ncube and John Mangudya' policies were going to worsen the foreign currency and fuel shortages across the country. The latest national budget by Mthuli Ncube has put a final nail on the coffin of ZANU PF government. Therefore, this piece seeks to demonstrate that a bloodless coup against ZANU PF government has just started. In November 2017, Guveya Chiwenga and SB Moyo staged a so called bloodless and unconstitutional coup against the long serving dictator Robert Mugabe. History is on the way trying to repeat its self, this time the bond notes and RTGS have started a process of initiating a typical bloodless coup (though constitutional) against the ZANU PF government. The war veterans and Matemadanda have responded to this (bloodless coup threats) by proposing that the president in Zimbabwe should be 52+ years old. I am convinced that Matemadanda and the war veterans' call is stage managed to diverge Zimbabweans from talking about the latest doctors' strike and the acute fuel shortages in the country. The ZANU PF government should not take the doctor strike for granted because it is going to spill to all sectors of the economy by January 2019. If the situation remains like this, schools may not be opened in January 2019 because the workers have realized that bond notes and RTGS are not currencies but ZANU PF papers and transections designed to steal pension and the livelihoods of people. You cannot cheat an adult with a doll claiming that it's a baby, that is what ZANU PF has been doing since 2000. I politely advised the controversial president ED Mnangagwa that he needs an inclusive government in order for him to finish his presidential term peacefully but nothing seem to be happening on the ground. I agree with the people who are claiming that Nelson Chamisa' demos are useless, can't push ZANU PF to a negotiation table because they are regulated and controlled by the system they are fighting. The only solution is for Nelson Chamisa to follow the way the doctors are handling their demo, they are Stay Away from the hospitals, neither policemen nor soldiers can go to their homes and throw teargas or shoot them. Nelson Chamisa should be warned that taking the people to streets under a military government is disastrous and bloody. The only way is for Nelson Chamisa to work with ZCTU, Teachers Unions, Doctors' Union and other workers' unions in order to put pressure on ZANU PF. This should be done in accordance with the constitution of Zimbabwe. The only weapon capable of hitting ZANU PF government is to organize massive ‘STAY AWAYS' from work, no police clearance is needed and soldiers cannot be unleashed to kill people. Nelson Chamisa and team should spend much of their time mobilizing workers rather than organizing for ‘toothless' demos in the streets of Harare. They should go for the ‘Stay At Home Demos (SAHD)' that are backed by the Zimbabwean law. It is also obvious that, out of the Zimbabwean workforce, MDC Alliance has more than 80% supporters if not 90%. They should use this as a leverage. The doctors' strike is definitely going to open a floodgate of strikes in all sectors and I can now see all workers coming together and finish ZANU PF. A period from January 2019 will be a volcano to ZANU PF governance, a period of ‘Stay Aways' that may shut the entire country down. You cannot force people to go and work for worthless bond notes and RTGS, all workers should unite against ZANU PF because we are all who we are because of ZANU PF and time has come for ZANU PF to go. 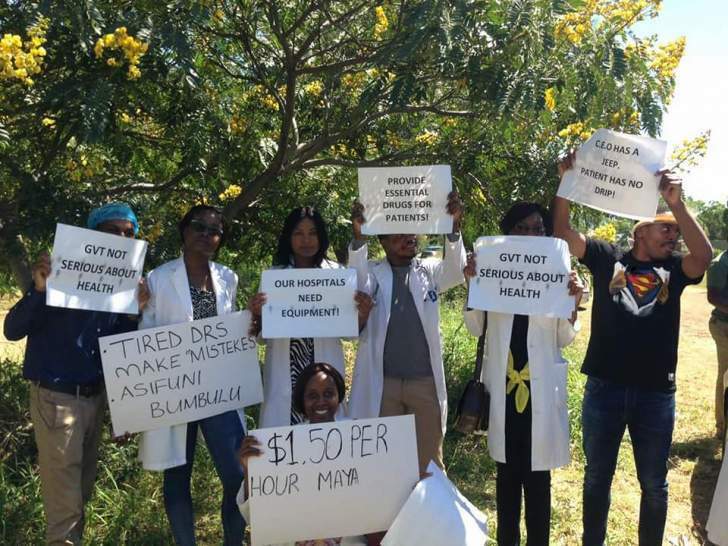 The latest doctors' strike has shocked ZANU PF government and opened floodgates of demos from January 2019. There is a highest probability that workers will shut the entire country down some time from January 2019. Nelson Chamisa should work with workers' unions because the MDC Alliance's current demos on the streets of Harare are toothless. What will happen if all workers refuse to go to work? ZANU PF government will be forced to scrap bond notes/RTGS or opt for an inclusive government. The statement by war veterans and Matemadanda on the age limit of a president is a reaction to doctors' strike, fuel shortages and threats by ZCTU and teachers to be paid in US$. Workers should not be diverged their attention by Matemadanda's useless utterances. I am appealing to Zimbabweans to ignore war vets and Matemadanda and focus of people's problems. However, all these strikes should be done according to the provisions of the Zimbabwe's constitution.